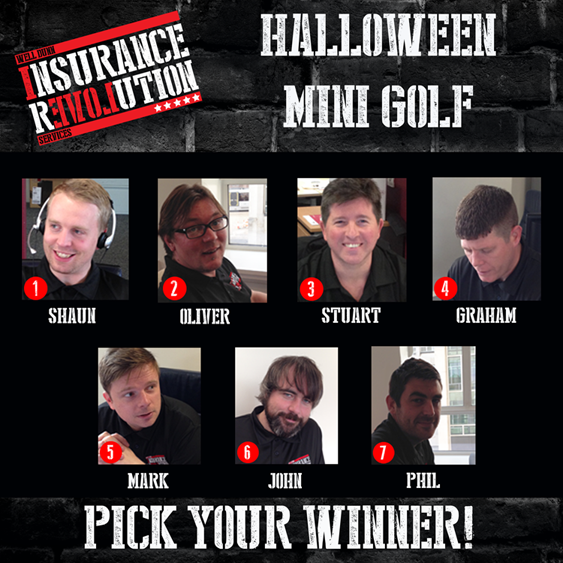 With Halloween just a few days away, Insurance Revolution has decided to run a spooktacular competition. As such, the team will be taking part in a Halloween-themed crazy golf tournament on the morning of Friday, October 31st – and all you have to do is guess which of our esteemed staff members will win. Or follow us on Twitter (www.twitter.com/InsRevolution) and retweet us. On Facebook, write the name of the team member you think will win in the comments section below the Halloween Competition picture. On Twitter, tweet us the name of the team member you think will win. If you guess the correct name, you will be entered into the prize draw. The competition will end on Friday, October 31st, at 12pm. Competition not open to Well Dunn Limited staff.